The conservative onslaught targeting Andrea can’t be measured on one hand or both hands, for these conservative commandos have put “all hands on deck” to insult her and any one else who has challenged the establishment because of their historic betrayal of conservatism and conservative movements. Speaking of hands, is it truly bizarre that those who are smearing Andrea and asking her to correct her tweet, have an incessant and odd obsession, should you choose to read their Twitter timeline, about the size of Donald Trump’s hands while promoting Marco Rubio? Hey Marcist Rubes, since we are being catty, have you seen Marco’s boots? Better yet, how about Marco’s hands all over amnesty, expansion of the H1B visa program, and his support of Obamatrade? I am unsure as to the size of Andrea’s phalanges, but she can certainly expect endless rounds of tactless and tasteless assaults on her looks and her credibility simply because she is a Trump enthusiast. Andrea, like the millions of americans who have shown enthusiasm for anti-establishment candidates, are viciously attacked and excommunicated by many “conservatives” in the GOP. Coincidence or Deflection? I will choose the latter. There is nothing more threatening to weak, flaccid males than a strong, outspoken woman. Likewise, there is nothing more threatening to the establishment than Donald Trump or Ted Cruz. If these self-annointed-know-it-alls were not so obsessed with Trump’s hands or Andrea’s statements, any objective person may look to the essence of her keen statement, wisely made during an election cycle that has highlighted the vast inequality which exists between those who have used their political power at the expense of those who gave them that power–the electorate. According to George P. Bush, he was inspired to serve by his Gampy and by Pat Tillman and considered active duty which led to “somber conversations with his wife.” Both of his heroes, our heroes, suffered injuries during combat, yet Pat Tillman met his untimely death by friendly fire. As the war hawks on the right are begging for more boots on the ground in Iraq and in the war torn middle east, Andrea’s question is timely and necessary as we enter an election season shrouded by political dynasties, political opportunists, a middle east in chaos, and the calls from many on the GOP ticket to put “boots on the ground” to combat Islamic terrorism. Her question begs the following questions: how many of the war hawks in the political establishment will pull on their own combat boots and arm themselves in the foxholes? How many kings, like King Abdullah of Jordan, serve in our midst? How many will send their sons and daughters into direct combat and suffer the same consequences as our wounded veterans–who only return home to find a Veteran’s Administration plagued with corruption, inept leadership, arrogant spending, and death panels. Yet, what parent wouldn’t try to shield their son or daughter from the casualties of war? Any parent would, but not all parents have political connections and clout. 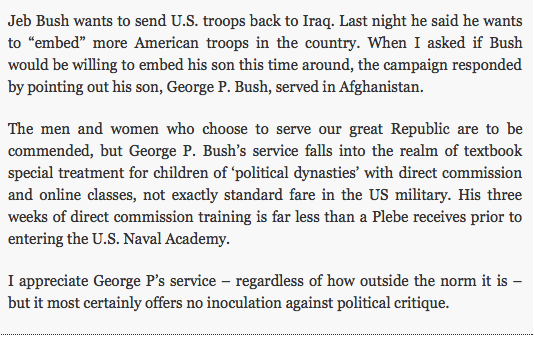 Although George P. Bush’s service in Afghanistan is to be commended, his political pedigree should be fair game and called into question. It is understandable that he used a pseudonym while serving behind intelligence lines for 8 months in Afghanistan, but his pseudonym can now be revealed along his experience while serving his country. Tell us about your NOI training, George. Tell us about your experiences in Afghanistan. As a veteran, tell us how you will reform the VA to provide world class healthcare to our wounded veterans. Heck, have a 24 hour fundraiser and raise $6 million for our vets. I do not see Andrea’s position as one that is hostile to our veterans. Her statements reflect a simply reality that exists in politics and in life: “It is who you know and not what you know.” Although George P. Bush knows Intel, he may not know combat because of who he knows. A smart girl leaves before she is left, and Andrea has left the conservative commandos against Trump oddly talking about size of a candidate’s hands instead of commenting on political realities, positions, or solutions, thereby showing the electorate their hands as establishment hacks. For that, I give Andrea a high five and a handshake for slapping them around and shaking things up. They can now add my two hands to their scrutiny. They can thank me later, and if they are lucky, I will shake their hands and feed their warped obsession. Yes,there are 2 Americas. The Political class and us.I agree. Just love Andrea Tantaros!!!!! I agree with your observations!! !